So Why Get a Wedding Film? In short, it's one of the biggest days of your life and you don't want to forget a moment of it. All of the dreaming, planning, time and energy you are now putting into this day will soon unfold, and it's going to be one of the most heartfelt memories of your life. Once it's over, your wedding film is a true reminder of what that day was all about. You will want to see the people who made it special, hear the words that were spoken, and experience again the genuine emotion of the day you married the love of your life. Many couples look back on their wedding and say it all went by in a flash. So how can you capture all those moments to relive and treasure in the years to come? We're the filmmakers behind M2 Productions, and documenting the stories of lovers is what we love to do! 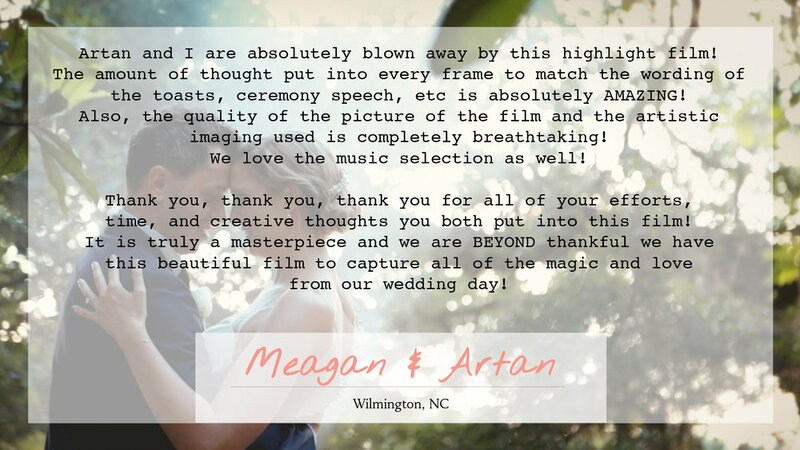 Both of us have experience in the wedding industry as well as promotional projects, writing, photography, and music, but love filmmaking the most because it combines all of those things. When we watch films, we feel like we’re entering another world. Being able to bring that experience to other people so that they can relive their most treasured moments in life is the best and most rewarding job we can think of! We started filming weddings in Wilmington, North Carolina and since then our cameras have taken us all across the Southeast, hitting locations such as Charleston, Raleigh, Durham, Pinehurst, Charlotte, Asheville, and many more amazing points in between. Filming in all these beautiful places has been a dream come true for us, but it's not just the places - it's the people! Over the last few years we've been privileged to meet and work alongside the sweetest, warmest, most interesting couples. Their stories and relationships inspire us, and each moment we film on their day just feels so monumental! We love weddings because they are a constant reminder of how special every moment is, and how precious all of the relationships we have truly are. To us, weddings are not only a celebration of the beauty and uniqueness of each couple, but also of all the family and friends who come together to share in their love story. Many of our couples have had family members who live in other countries, so it's incredible to know that our films have been viewed all over the world. The idea that families in Russia, Romania, Kosovo, India, Germany, Italy, England, and Mexico have gathered together to share in our couples' joy through these films just warms our hearts! Want to see some of our films? If you are looking for a different approach to a wedding film, then you have come to the right place! We make your wedding film with the knowledge that it will be one of the most watched films of your life. As artists, we believe in what we do and enjoy offering an uncommon level of depth and personalization in our films. We are a small company, and operate in a boutique fashion. This means that we will be right there with you, directly involved in every stage of the filmmaking process. From the first time you reach out to us and share the details of your story, through to the final edit, we give your wedding the kind of personal attention it deserves. We have a fresh outlook on filmmaking that takes a unique approach to each couple we work with. With every wedding, we are prepared to go above and beyond to design a film that will speak intimately to you and thoughtfully represent the spirit of your love story. Our single goal is to create films that will connect with our couples and their families for the rest of their lives. We have the passion, experience, technology, and attention to detail to capture the fleeting moments at the heart of your special day. We believe the memories of your wedding are truly worth cherishing forever, and hope to have the honor of being your wedding filmmakers! Have a look around, and please take some time to check out our films. If you think we would be a good fit for you and your wedding, we'd love to talk! We've had the pleasure of filming weddings big and small so the more we hear about your plans, the better we can understand what you're looking for in a wedding film. Below you'll find some answers to the questions that we get most often. If you don't see the answer to your questions, or would simply like to learn more about working with us, feel free to contact us here or send us an email. 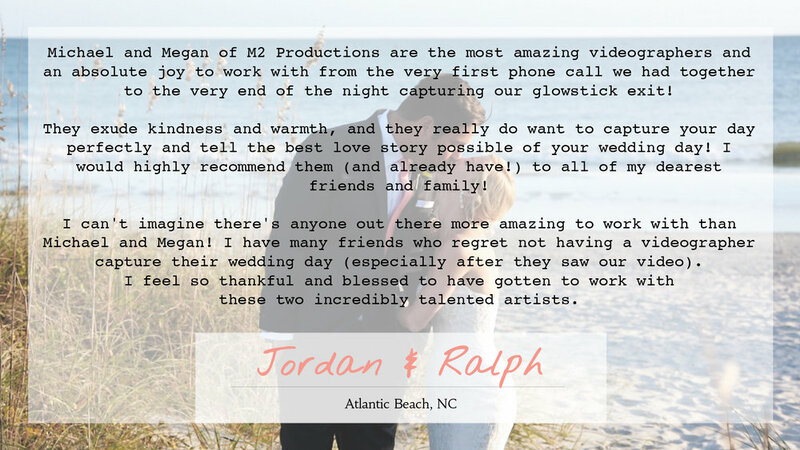 We see it as a huge honor to be considered to film your wedding day. Thanks so much for checking us out! Ready to create an unforgettable film?